On the occasion of the Silver Jubilee of the Bhandarkar Oriental Research Institute, which was celebrated in January 1943, I edited, on behalf of the Institute, two Volumes-Progresses of Indic Studies and the Silver Jubilee Volume of the Annals of the BORI. 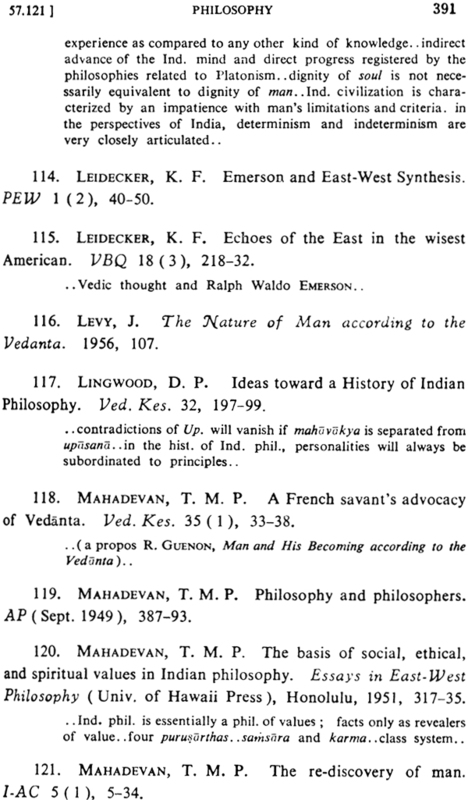 The purpose of the first of these volumes was to present an exhaustive survey of all important work done in several fields of Indology, in India and outside, during the period of twenty-five years from 1917 to 1942. I have written for that volume a paper on “Twenty-five Years of Vedic Studies”. While collecting material for that survey, I felt the most urgent need of a scientifically-planned analytical bibliography of Veda and allied antiquities. 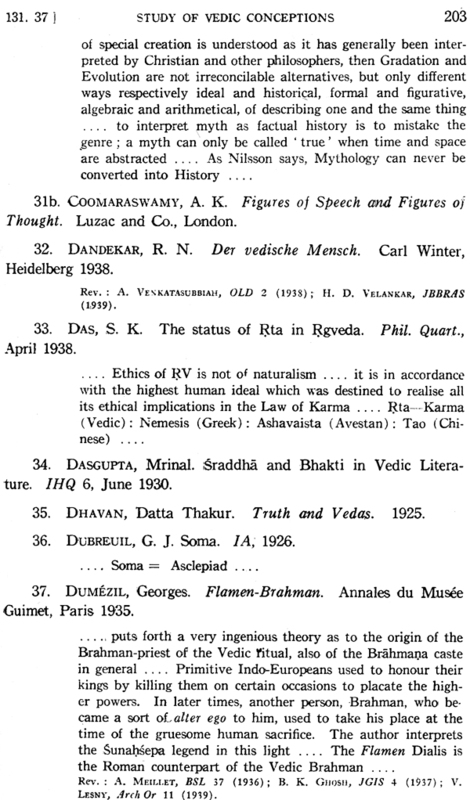 Professor Louis RENOU has, in his monumental Bibliographie Vedique (Paris 1931), given almost a complete record of all that has been done about Veda in any country up to 1930. That remarkable work, which evinces colossal industry on the part of the compiler, contains about 6,500 entire and forms an exhaustive index of all published Vedic texts and the entire body of exegetical and critical literature connected with those texts directly or indirectly-A similar bibliography of all work done in this field, since 1930, was urgently needed. 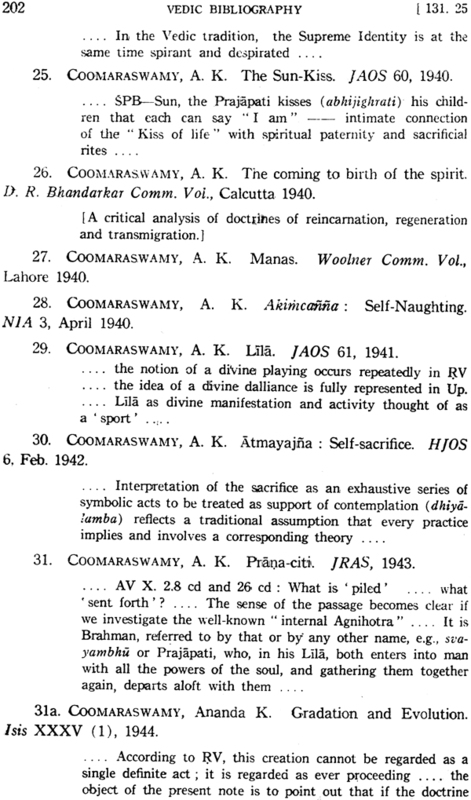 I therefore undertook to do that work myself and also announced, in my article in Progress of Indic Studies, my intention to publish my Bibliography at an early date. 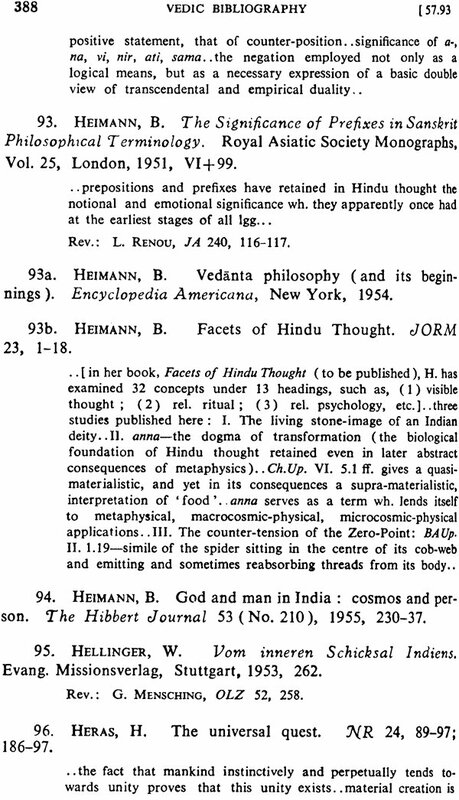 The present Vedic Bibliography is the fruit of my single-handed labour in that direction. I propose to prepare and publish, at suitable intervals, further volumes of this Bibliography. I continue to collect material for that work. 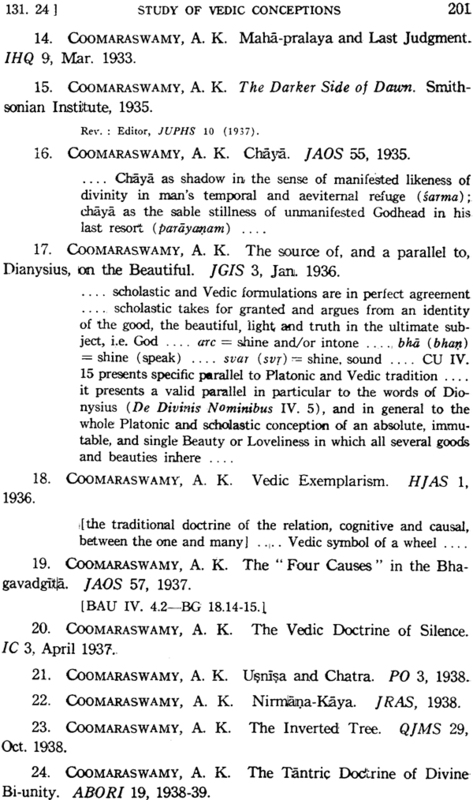 The present Vedic Bibliography may be regarded as the continuation of the great work which has been done by RENOU through his Bibliographie Vedique. 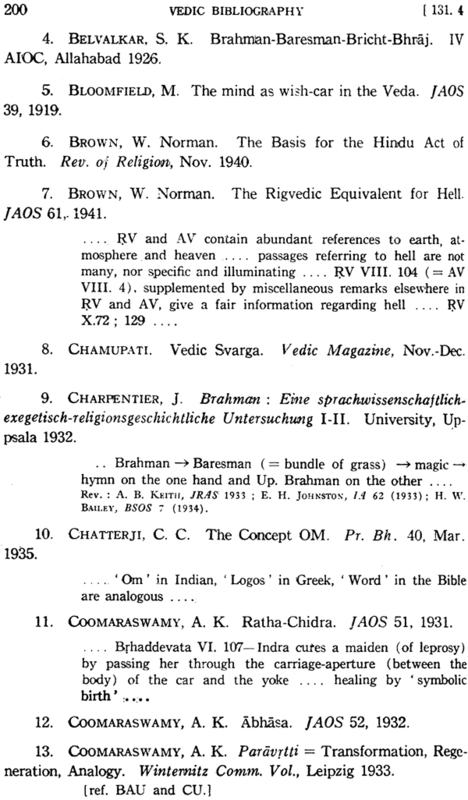 I have tried to present through my Bibliography an exhaustive analytical register of all significant writings, dealing with the Veda and allied antiquities, which have been produced between 1930 and 1945. Several writings on the subject belonging to the period before 1930, which have not been referred to in RENOU’S Bibliographie, have also been included in this work. This Bibliography contains about 3,500 entries which are divided subject wise in 21 chapters and are further subdivided in 168 sections. I have given the essential contents of a large number of important writings either in the words of the writers themselves or of the reviewers or in my own words. Important reviews on the works have also been mentioned. A detailed table of contents given at the beginning will clearly indicate the extent of the entire work. Special mention may however be made of the fact that a complete analytical bibliography of all work done up-to-date in the field of the Indus Valley Civilisation is given here for the first time. I have tried to make this Bibliography as complete and up-to-date as possible, and still I am conscious of its many deficiencies. In this connection, attention may be particularly drawn to the longish Supplement added to the Bibliography. In my work I have generally followed RENOU’s plan. But the constant use, which I had to make of RENOU’s Bibliographie for my own Vedic researches, had persuaded me to think that the method of classification of entries adopted by RENOU could have been more practical and useful. I have therefore slightly modified that method in my Bibliography. A glance at the tables of contents in the two works would make this point clearer. While classifying the entries, greater consideration is shown to the contents of books and articles rather than to their titles. A complete list of periodicals etc., and indexes of authors and words, which are given in this Bibliography, will, it is hoped, be found useful. My first word of thanks in connection with the publication of this Bibliography is due to Dr. S. M. KATRE, the Director of the Deccan College Research Institute, Poona, and the Editor of the New Indian Antiquary. All along he evinced a genuine personal interest in this my work and ultimately persuaded the karnatak Publishing House to undertake its publication in the “New Indian Antiquary Extra Series”. I must also thank my friend and colleague, Prof. P. K. GODE, the Joint Editor of the New Indian Antiquary, who has helped me mit Rat and Tat throughout the preparation of this Bibliography. The academic collaboration of Professors KATRE and GODE for the last several years has now become almost proverbial and has proved a very unique and fruitful phenomenon in Indology. Without their interest in my work, I wonder how this Bibliography could have been published so early. I am indeed very grateful to both these friends. While compiling this work I had to write to several scholars doing Vedic research and I am thankful to all of them for their ready response. As usual Prof. C.R. DEVADHAR and Prof. R.D. VADEKAR, my colleagues in the Fergusson College, have given me great encouragement in my work, and so, even at the risk of appearing formal, I thank them. I also acknowledge my indebtedness to the University of Bombay for the grant-in- aid made towards the cost of the publication of this work. 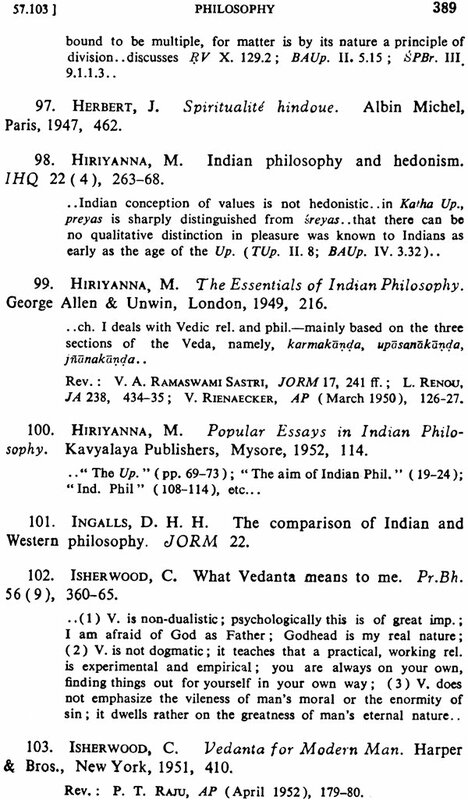 This third volume of my Vedic Bibliography constitutes a more or less comprehensive analytical register of all significant writings relating directly or indirectly to the Veda and allied antiquities including the Indus Valley Civilization, which have been published in India and abroad during the period roughly from the beginning of 1961 up to the middle of 1972. An attempt has also been made to fill in, as far as possible, the lacunae in the earlier two volumes. Though the present volume of the Vedic Bibliography closely follows the pattern of the second volume, it will be seen that its scope and extent have been substantially widened in several respects. I am fully conscious that, in view of the fast and tremendously growing publication activity in all parts of the world, no bibliography (particularly when it happens to be the work of a single individual) can boast of being even moderately exhaustive. I shall, however, make the modest claim that I have spared no pains in making this volume as full, complete, and useful as possible. And in this my effort I have received the most ungrudging help and cooperation from a large number of friends and colleagues. The spontaneous enthusiasm with which the earlier two volumes of my Vedic Bibliography were received has also proved a source of great encouragement. I feel highly grateful for all this kind fraternal consideration. I may incidentally add that, anticipating similar kindness, I have already started collecting material for the next volume of the Bibliography. The two Indexes at the end of this volume have been prepared by my pupil-friend Dr. G. U. THITE, and I cordially thank him for the same. I cannot close this preface without a word of sincere appreciation of the remarkable efficiency and expeditiousness with which the Bhandarkar Institute Press has accomplished the printing of this volume. Finally, I hope to be excused for feeling not a little elated by the fact that the publication of the present volume of my Vedic Bibliography coincides with a memorable event, namely, the centenary-year session of the International Congress of Orientalists. An attempt has been made to present through this fourth volume of my Vedic Bibliography a fairly comprehensive and critical record of most of the significant work which has been done in the field of Vedic studies during the period roughly from the middle of 1972 to the middle of 1983. As in the earlier volumes, brief analyses of the contents of a large number of books and articles recorded here, and, in many cases, of the important reviews, have been given for the benefit of the users of this volume. It should be noted that the chapter relating to the Indus Valley Civilisation, which has figured in the previous volumes of the Vedic Bibliography, has not been included in the present volume. I hope to publish it separately somewhere else. The two 'Indexes to this volume have been compiled by my pupil- friend Dr. S. K. Lal of the Centre of Advanced Study in Sanskrit, University of Poona, and I take this opportunity of expressing my cordial and grateful appreciation of his collaboration. I have also to thank the Bhandarkar Institute Press for its efficient and ungrudging cooperation. 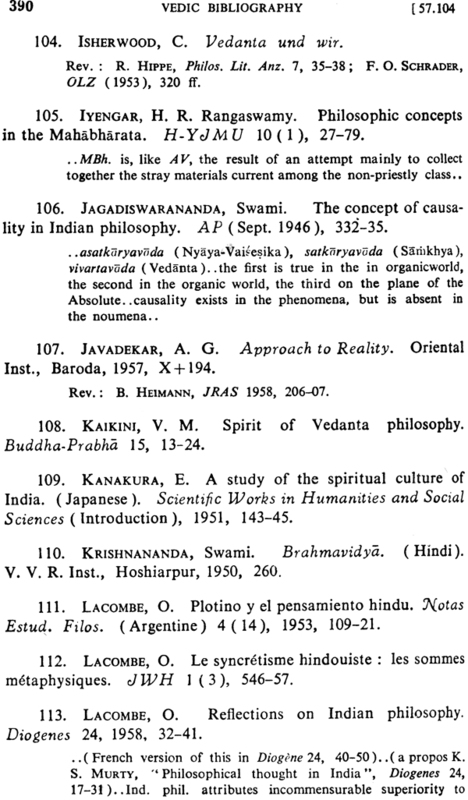 This is the sixth volume of Prof. R. N. Dandekar’s Vedic Bibliography. It is “a fairly comprehensive, classified and critical record of the most significant work which has been done in the field of Vedic Studies” (Prof. Dandekar’s Preface to the fifth volume) during the period from 1992 to 2000. This volume also contains the titles of articles and books along with the summaries of their contents, and in many cases, reviews of the books. 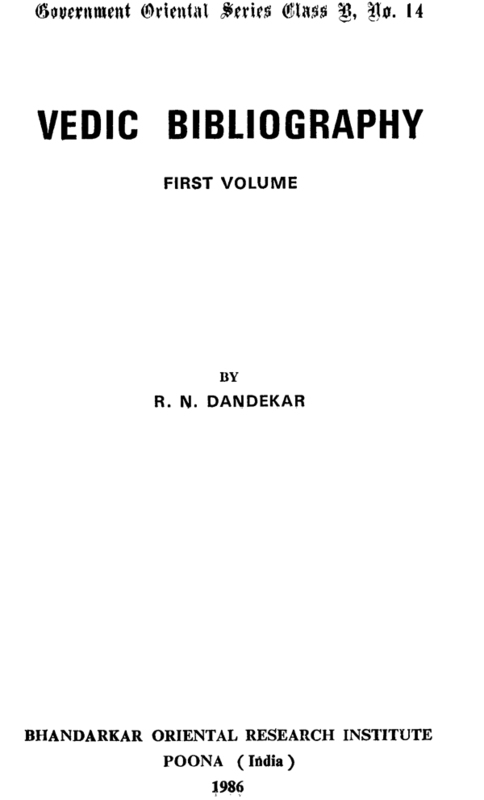 After the work of printing of this volume from pages 1 to 800 was done, Prof. Dandekar passed away on the 11th of December 2001. He had also partly seen the first proof of pages 801 to 808. The editing of the remaining work was then assigned to Dr. G. U. Thite. The two indexes to this volume have been prepared by Dr. S. K. Lal. Shri. Shreemad L. Bapat has assisted Dr. Thite in preparing the press-copy and in reading proofs. I thank Dr. Lal and Shri. Bapat for their co-operation. Thanks are also due to Shri. D. R. Pawale and the press staff for their efficient and ungrudging work. It is intended to continue the work of the Vedic Bibliography in the Bhandarkar Oriental Research Institute. I request the scholars to extend their co-operation in future also.